Focus of Training: Fire /Safety /Radar Navigational /Leader- TAACCCT Grant Consortium for Mississippi River waterways, ship /Basic Medical. Many courses approved by the U.S. Coast to provide federally funded training to licensed mariners. Guard to assist mariners in obtaining, maintaining, and up- Biggest Success: Delgado’s high quality instructional staff and grading their licenses, both limited and unlimited. program delivery has led to worldwide recognition of our facility. Simulators: The current facility houses two wheelhouse simulators The school stays abreast of all industry trends to allow licensed that provide tandem exercises for participants. In the new Training mariners to maintain or upgrade their workforce positions. Other Information: The Delgado Maritime Facility was select- ? re ? eld will also receive an expansion to offer more maritime ed to be the Louisiana Community College to join the Federal and industrial ? re ? ghting programs. Seafarer (STCW) Competencies, Facilitation of seafarers in mak- Preventive measures, Safety aspects, the Role of shore-based ing the transition to shore-based positions and roles. Awareness managers in preparing for surveys, Maintaining hull/ coating building about the maritime sector, Facilitation of lateral entry of conditions, Interpretation of ? ndings from inspections, and steel personnel into the maritime sector, Provisions of Regulation 2.8 of renewal estimates. 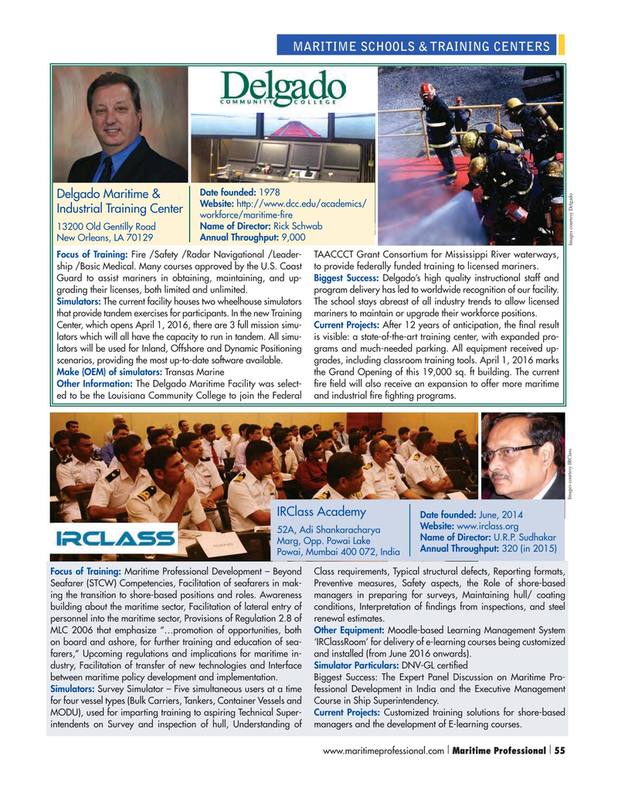 MLC 2006 that emphasize “…promotion of opportunities, both Other Equipment: Moodle-based Learning Management System on board and ashore, for further training and education of sea- ‘IRClassRoom’ for delivery of e-learning courses being customized farers,” Upcoming regulations and implications for maritime in- and installed (from June 2016 onwards). Simulators: Survey Simulator – Five simultaneous users at a time fessional Development in India and the Executive Management for four vessel types (Bulk Carriers, Tankers, Container Vessels and Course in Ship Superintendency. MODU), used for imparting training to aspiring Technical Super- Current Projects: Customized training solutions for shore-based intendents on Survey and inspection of hull, Understanding of managers and the development of E-learning courses.